Carlton & United Breweries has announced the first extension of its successful Fat Yak brand and in doing so has flagged a major shift in its strategy around craft beer. Lazy Yak is an Australian Pale Ale weighing in at 4.2 per cent alcohol by volume and made with Nelson Sauvin, Citra and Cascade hops. It will be an all-malt beer and carry 15 IBUs, around the same level of bitterness as most mainstream lagers on the market and 10 IBUs shy of its brand mate, Fat Yak. 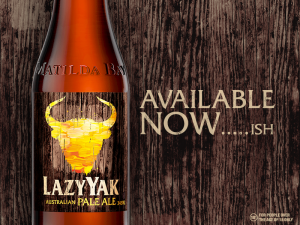 Fat Yak was launched under the Matilda Bay brand in 2008 and has been a runaway success for CUB. Despite a variety of attempts to create further brands with similarly quirky appeal through Matilda Bay, CUB has struggled to recapture the same lightning in a bottle. 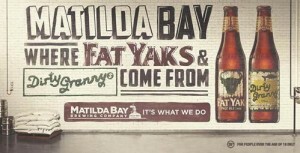 Fat Yak has proven to be such a strong brand for Matilda Bay it has come to dramatically overshadow its parent. National campaigns aimed at reflecting some of the gloss off Fat Yak back onto Matilda Bay have largely failed, leading to the current move to create a stand-alone brand franchise on the successful Yak name. The focus on the Yak name and brand extensions signals a major change of focus by CUB which has lagged behind competitor Lion in the craft beer market. This week Australian Brews News had an exclusive chat with Tim Ovadia, CUB’s head of brands – craft & Australian premium. In a very frank interview, Ovadia provided an insight into the Yak strategy and CUB’s approach to the developing craft market. Ovadia said the Yak range has spun out of what the market really wants and the success of the Fat Yak brand. “The craft category is growing and it’s growing by getting what we call ‘craft considerers’, our mainstream lager drinkers who are looking for more flavour in their beer, to experiment in the craft category,” he said. “When they enter the craft category, we know these guys are looking for recognisable brands that they can trust and beers that are kind of unique and are flavoursome but are still easy drinking enough for them to have in sessions. “From our perspective we wanted to look at what brand we were going to use to help those consumers go on a journey? “That was a no-brainer from our perspective because if you think about the role that Fat Yak played originally, it was one of the pioneers of taking craft beer to the masses. “And so we thought why not expand and extend the Yak franchise and the Yak brand, and take the quirky humour and personality of the Yak and expand it across a range of beers? Ovadia said the intention is to add new members to the ‘Yak family’, which will be a specialist range of ales. They will be made with signature Yakima Valley hops as part of the backstory and all will be made with 100 per cent Australian malt. Ovadia describes them as smooth and flavoursome ales that the company hopes will continue the journey of taking craft beer to the masses. With the success of Fat Yak, CUB has struggled to transfer that success onto to the wider Matilda Bay range and to leverage the Matilda Bay brand off it, a move that has largely failed. “When consumers drink Fat Yak, our research tells us the brand they engage with is Fat Yak,” Ovadia said. The company plans to establish a Matilda Bay brewing capability as part of the CUB brewing network that will have its own dedicated brewers attached to it. “We will look to take the existing Matilda Bay SKUs that are in the marketplace, heritage SKUs like Beez Neez, Redback, Minimum Chips, those brands are great craft brands, they were pioneers and classic craft beers in Australia. These will be presented as a boutique range targeted to what CUB identifies as a niche market. The approach has a feeling of these beers are too big to kill off, but too small for a company the size of CUB to be put further energy into nurturing. “When you’re a large organisation where you’ve got that type of range, they’re too small to make a massive difference to the overall business and they’re too big to get rid of them without having an impact on the overall business,” Tim explained. “So that’s why we’ve developed this strategy. They’re great beers for a certain group of consumers – I wouldn’t say die-hard craft drinkers – but passionate craft drinkers who really like these products. “I think some of them [the classic beers] have flavours that are limiting and mean they won’t cross over to mainstream, some have names that are limiting and mean they won’t cross over to mainstream,” he said. The classic range will encompass beers such as Alpha, Dog Bolter, Redback, Beez Neez, Bohemian Pilsner and Minimum Chips. While no decisions have been made yet, it seems likely that some of the newer brands will be deleted. In addition to the Yak range, and the Matilda Bay ‘classic’ range, the business will develop a new brand franchise off the Matilda Bay name next year. With such a focus on big brands and an apparent diminishing focus on the niche segments, the company appears to see little value in the pointy and experimental end of the craft beer market. Despite it being the truly innovative engine of the market and the sector that is bringing attention back to beer, the company appears to view it as a niche uneconomical to target. CUB’s strategy would appear to be abandoning the progressive, but low volume end of the market, instead targeting the mainstream beer market with beers carrying craft cues. “What makes craft beer appealing to people, has mass appeal. So the things that are driving the growth of craft beer are: authenticity, the local nature of the craft breweries, quality ingredients and unique beer styles and different beer styles,” he said. “So do I think craft has limited potential? No, because I think the drivers of craft have massive potential to completely reinvigorate the beer category which I think it’s doing. “Do I think that a plethora of extreme craft beers with high BUs and super-high hoppiness levels have limited appeal? Yes – that’s not an opinion, that’s a fact. It’ll never cross over to a broader group,” Tim said. For all of the tinkering around Cascade, CUB acknowledges it has struggled to position the brand as a craft beer. “We acknowledge that we asked Cascade to fill the role that we don’t think was inherently core to its DNA,” Tim explains. “We tried to reinvent Cascade as a craft beer brand, take advantage of that growing category when really it was positioned in consumers’ minds as something very different to that,” he said. “Our strategy on Cascade is to look at returning Cascade back to what made it successful in the first place, and also to double down on its strengths. Wow, that’s a lot of stuff ups that Tim Ovadia has to try to explain away. I hope they weren’t all his decisions as it couldn’t make great reading from CUB’s management and board position. To be quite honest, it looks like CUB doesn’t have a clue about what it’s doing. First it has a half-hearted push at being crafty with Matilda Bay, doesn’t get close to what Lion has managed to pull off, and is now trying to shoot itself in the foot by diluting the brand of one of its few successes. I love how they’ve decided they want to rebuild a separate Matilda Bay brewing capability after closing the Port Melbourne brewery. Actually building demand in a new market instead of just waiting for it to come to you must be too hard. Also, wow, ‘Lazy Yak’, that sums it all up really. Actually the Lazy Yak will be made at Abbotsford for the time being. How crafty! – Think Matilda bay will stay down at Cascade? Think again. Seriously, I’m drinking this in an airport bar and it’s awful. The article above and this beer shows CUB have no clue when it comes to craft. Don’t get me wrong, I love a VB or 6 but this lazy yak has an appropriate name when it comes to craft beer. Are you guys kidding? Lazy Yak is a great beer even my Wife likes it. Keep up the good work CUB, but lets not let us get into a great beer and then take it away from us. As it happened with Hahn I loved the pure blonde white and they stopped making it!! devastated! !